Home » Mercedes-Benz Sprinter Cargo Van » What’s included in the Sprinter Refrigeration Prep Package? When you buy a van for your fleet, you may need it for a variety of reasons. If you need to keep the back cold then you may be wondering if the Mercedes-Benz Sprinter vans offer refrigeration. We have your answers right here. You may be surprised at what the Sprinter can do straight from the factory. 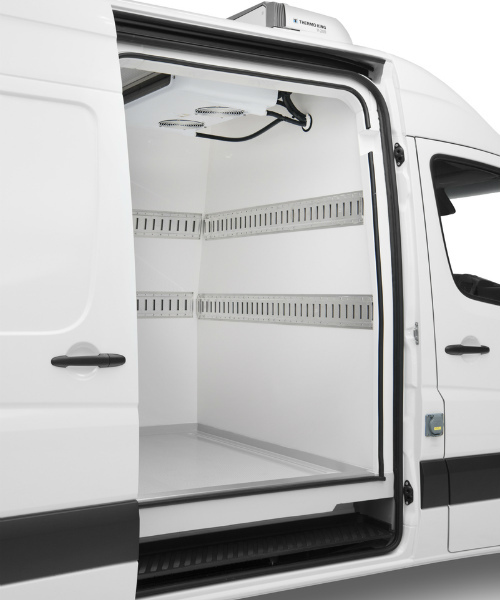 Yes, the Sprinter Cargo Van is perfect for a refrigeration upfit. Though you cannot get refrigeration from the factory, you can get the Refrigeration Prep Package, which will make the upfit all the easier and also give you several other amenities along the way. 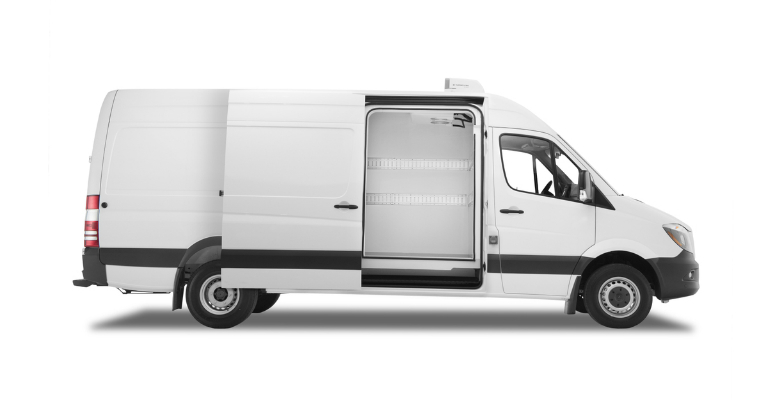 The Refrigeration Prep Package is only available on the Sprinter Cargo Van as neither the Crew Van nor the Passenger Van are ideal for businesses that require refrigeration. Beyond that, you will need to opt for at least the High Roof. This package is otherwise available with any wheelbase, and is even available with the Super High Roof and 4X4 options. To prepare for refrigeration, the cargo wood floor is removed and brackets for the A/C compressor are added. Multiple cable ducts will also be installed to allow for easily routing cables through the cargo van when the upfit occurs. On the battery front, this package replaces the standard battery with a 12 volt 96 amp deep cycle battery. In addition to your engine battery, this package also adds a 100-amp auxiliary battery. This ensures you can keep the back-end cold for a long time even when the engine isn’t running. The auxiliary battery also has a dedicated cut-off relay. How many different vans does Mercedes-Benz offer? Refrigeration Prep Package also adds a whole host of other amenities that you or your driver get to take advantage of. On the safety side of things, a this package adds a first-aid kit along with blind spot monitoring. Since a refrigerated van rarely has an easy view of the road behind, this package also comes with a rearview camera and an audible backup alarm. Other creature comforts include cruise control, overhead controls with reading lights, light and rain sensors, and two additional master keys. Build your business with the Sprinter lineup whether you need a refrigerated van or a simple work van. This entry was posted on Wednesday, September 20th, 2017 at 10:20 pm	and is filed under Cargo, Mercedes-Benz Sprinter, Mercedes-Benz Sprinter Cargo Van. You can follow any responses to this entry through the RSS 2.0 feed. Both comments and pings are currently closed.